Fredric Drum is in Egypt. Apparently, for no specific reason, he gets wrapped into a mystery that threatens to drive him insane. It becomes a struggle of life and death, surrounded by elements from ancient history, the Kheops pyramid, mummies and unexplained murders. A classic Nygårdshaug novel, filled with mysteries, exotic knowledge and excitement to the last page. With his books about Fredric Drum, gourmet, decipherer of ancient mysteries, food and wine. Gert Nygårdshaug has established himself as a distinguished and original criminal writer. Nygårdshaug´s books with Frederic Drum has intense excitement, fun mysteries and interesting historical plots. Those who find Dan Brown and Tom Egeland ́s books are refreshing and exciting will appreciate Drum. 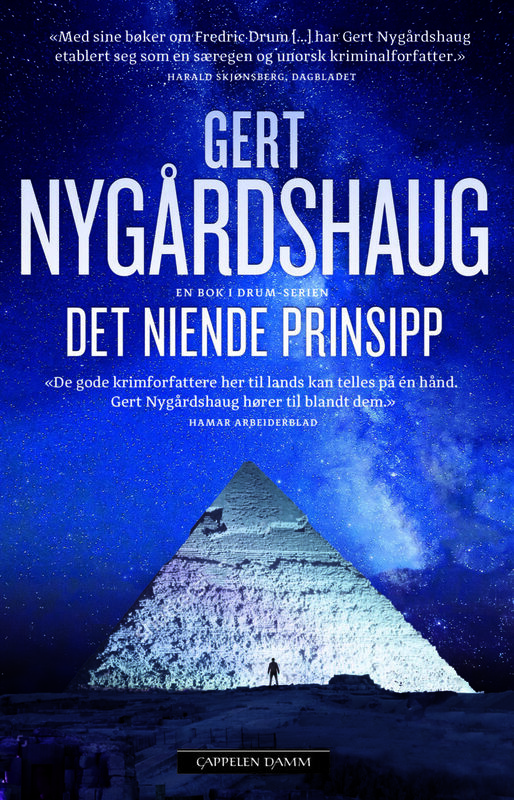 Gert Nygårdshaug is in my opinion a more sophisticated and challenging writer intellectually. He has a literary high level in his novels, while he also shows the ability to make "impossible" plots that are credible . It is a delight to read these books whether you are interested in ancient history or not.